Issue 1: Google Analytics combines revenue from your transactions and goals. That can lead to double counting, if for example, an add-to-cart click is a monetised goal. Note this post 1 of 2 aimed at AdWords account managers who need a much greater understanding of how to optimise campaigns. By nature, this is deep dive analytics, but it is not technical – no coding required! Post 2 (coming soon!) shows you how to use the REAL ROI calculations to do this. If you use a bid management tool this article will help you understand the methodology employed behind it. A negative ROI means you are spending more than you are making. For example, ROI = (50 – 100)/100 = -50%. From Keyword 1 shown in Figure 1, a reported ROI of 823% suggests you can spend 9x as much on your AdWords advertising and still make more than you spend (i.e. maintain a positive ROI). Clearly this is flawed. What if your profit margin is only 40% of your sales price? i.e. 60% of your sales price is for your materials/manufacture/purchase price. This of course changes your ROI calculation and I refer to this modification as your REAL ROI. OK, now we know the default ROI values in Google Analytics are redundant so we need to modify the calculation for the real-word… BUT, before doing this, how significant is the difference? As you can see in Figure 2, we are not tweaking the edges here! Figure 2 – How big a difference is the Google Analytics default ROI versus the REAL ROI? Data taken form Table 1. The differences are substantial e.g. for Keyword 1, its a difference of 2,700%…! Calculating your REAL ROI is therefore a must step. It takes the information available in GA to another level – one that reflects the real-world situation. This will have a significant impact on how you optimise your AdWords accounts. Simple right! This means you can afford to spend up to 140% more money (2.4 times as much) in AdWords without producing a negative ROI. That’s good news, though a very different figure from the 500% that would be shown in your Google Analytics reports by default. Note that when a keyword does not generate any revenue (zero revenue), its ROI and REAL ROI values always calculate as -100%. Table 1 is what we are going to build using a custom report and Google Docs. Table 1 shows the numbers when a profit margin of 40% is assumed for a transaction. Table 1 – Comparing REAL ROI versus the default ROI from Google Analytics (transactions). Values taken from Figure 3. [sidebar] Table 1, assumes a fixed profit margin for each purchase. However, you can adjust this on a per product basis, and even time basis i.e. maybe you have different margins during the summer sales. To look at ROI of a per product or category basis, apply an advanced segment e.g. include product category = widgets [/sidebar]. You can build your own equivalent of Table 1 by obtaining values form two GA reports – the “Clicks” tab for cost and default ROI data, and “E-commerce” tab for revenue and conversion data. However, to simplify matters I have created a custom report to combine the required metrics into one report – see Figure 3. Download the custom report template and apply it to your e-commerce data. Your report view will match Figure 3 with different numbers of course. If required, Chapter 9 of the book describes the process of building custom reports with examples. [sidebar] Figure 3 has additional columns that are not required for your REAL ROI calculations (Average Price, Conversion Rate). However, these are included here for use in my next post on how to actually use your REAL ROI to optimise your AdWords campaigns. [/sidebar]. Expand the number of data rows in your custom report as needed – the default is 10 but you can select upto 5,000. Now export your custom report data into Google Docs. Once the data is displayed, cut and paste my formulas (columns H-J) into your exported spreadsheet. My spreadsheet is “view only”, therefore save your own copy to play with. Adjust the profit margin column accordingly (I use 40%). Notice that in my spreadsheet I have re-calculated the default ROI (column H) using only the e-commerce revenue data. This is to exclude monetised goals from the default calculation – avoiding Issue 1, described at the start of this article. Voila – Your REAL ROI is calculated for you. That’s all there is to it…! You can now read the slightly more complicated process for non-transactional sites, or skip to the So What…? section below. When you have designed your GA setup to capture multiple engagement points – that is, you have multiple goals configured that are aimed at the same visitor. The issue is, what to do if completing Goal 2 also triggers Goal 1…? For example, “registration started” (G1) followed by “registration completions” (G2). The second goal depends on the first and so including all completed goals in your REAL ROI calculations will result in double counting. You have a mix of goals that are monetised and some that are not. Clearly, including non-monetised goals will dilute your REAL ROI and so these need to be omitted. In my example REAL ROI calculation below I assume ALL your goals to be monetised and independent. It’s not a big problem if that doesn’t describe your situation. If you have non-monetised goals and/or dependent goals, simply adjust the custom report I provide below to only consider a specific monetised Goal(NN). You can also add multiple independent goals – just sum the goal values and goal completions for the REAL ROI calculation. Table 2 is what we are going to build using a custom report and Google Docs. Table 2 shows the numbers when a profit margin of 40% is assumed for a goal. 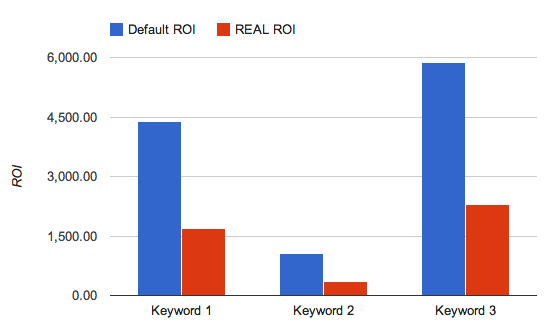 Table 2 – Comparing REAL ROI versus the default ROI from Google Analytics (goals). Values taken from Figure 5. You can build your own equivalent of Table 2 by obtaining values form the separate GA reports. However, as for the transactional example, I have simplified matters by creating a custom report to combine the required metrics into one report – see Figure 5. Download the custom report template and apply it to your goal data. Your report view will match Figure 5 with different numbers of course. If required, Chapter 9 of the book describes the process of building custom reports with examples. [sidebar] In Figure 5 there is an additional column shown in the report that is not required for your REAL ROI calculations (Goal Completions). However, this is included here for use in my next post on how to actually use your REAL ROI to optimise your AdWords campaigns. [/sidebar]. Expand the number of rows in your custom report as needed – the default is 10 but can select upto 5000. Now export your custom report data into Google Docs. Once the data is displayed, cut and paste my formulas (columns G-I of Figure 6) into your exported spreadsheet. The spreadsheet is “view only”, therefore save your own copy to play with. Adjust the profit margin column accordingly (I use 40%). Voila – Your REAL ROI is calculated for your goals. So What…? How do I use REAL ROI…? For this post, you use the REAL ROI to optimise your AdWords advertising budgets properly. Its purpose is to take you to the next level – allowing you to move beyond adjusting bids simply based on conversions. That is, optimising for conversions is a great first step (please don’t rely on ad click-throughs), however it assumes all conversions/sales are equal. Obviously they are not in the real-world. Using your REAL ROI allows you to focus your budgets on acquiring the “highest” value converters. In my follow up post – coming soon – I described how you can use your REAL ROI numbers to optimise your AdWords account (it was too much detail to put all in one post!). ROI calculation also takes into account the cost of goods sold, which is the cost of manufacturing, distribution, shipping, and any other fixed/variable cost associated with the product. The AdWords cost is added to it. So, it’s effectively calculating the real ROI. Not saying that this article gives it wrong. Here, Google ROI calculation is assumed to be taking only the Google advertising cost into account. I am trying to work out my real ROI – we also have postage costs associated with each online sale – therefore, would I be right to also remove that from my revenue (so using my Net Profit)? If I do, then I also need to know how many sales occurred – now, should I use Analytics “Transactions” for this number, or my Adwords tracked Conversions – which will give a truer reflection of ROI? Thanks for your help! Getting a bit confused! @Sarah – when calculating your profit margin I recommend you exclude all expenses that are related to the sale. So yes, exclude shipping costs. AFAIK Adwords still uses a third-party cookie. These are much more likely to be blocked than the default first-party cookie of GA. Therefore, stick to GA for you transaction numbers. BTW, please add your input to this poll: https://brianclifton.com/blog/2016/02/17/3rd-party-cookie/. The “related articles” section at the bottom of that post will give you more background info on cookies and privacy. I agree that the ROI displayed by Google Analytics is misleading, but I ran across another article that tackles actual ROI from a different angle. Your ROI from AdWords is Higher Than You Think It’s simple and really makes sense to me. It certainly would explain why we’ve gotten such great results. Thoughts? What bothers me about PPC ROI calculations like this is that it’s done without consideration of the effects of organic listings that are on the same results page. PPC listings are given credit for visits that would have happened anyway, if there happens to be an extremely high organic listing right below the paid listing. This is the case for many brand terms. To really understand the payback of PPC, the cost per click should be calculated as the PPC spend for that term divided by the number of clicks that PPC gets over and above what organic listings would have gotten by themselves. Depending on the cannibalism rate, the actual cost per click can be significantly higher than the nominal cost. I could expand on this, but I’ll stop there. (I can hear sighs of relief) Comments?